The World Cup South Africa is not the only world tournament taking place this year. In August, Turkey will host the 2010 FIBA World Championship. Best basketball teams in the world will fight to claim the top spot. Considering the huge popularity of basketball in the States, in China and some parts of the Europe this event is going to be a fantastic one. Turkey has been preparing for the Championship for years, building modern arenas in many cities. Recently, they launched the promotional campaign. Today, I would like to evaluate the visual identity of the 2010 FIBA World Championship. Let’ start with the logo. Two elements are obvious: The Turkish flag and the basketball. The designer used a bleeding flag, giving it a more modern and edgy look. Underneath the crescent you can see the friendly typography the Turkish Ministry of Tourism uses. However, the typography has one more element: a tulip. For those who are not familiar with history, tulips originated from the Ottomans and the Turkish Republic wants it to be used on all communications. Very good for consistency. Not so good for this logo. Because there is another tulip in the basketball, which creates duplication, noise and busyness. Also the basketball is in gray, a weird colour decision I cannot understand. Overall, the logo has five colours and too many elements, making it very costly logo to print and replicate. From brand strategy point of view, this is a poorly designed logo. Next, let’s look at the mascot. First of all, an organization would use a mascot to appeal to younger audiences. So your mascot should be kid friendly. Seriously. Is this a mascot that you would want your kid to look at? 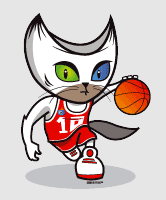 The mascot is based on a distinctive breed of domestic cat that is found mainly in the Lake Van region of Turkey (Ironically, there will be no games in Van). It is unique because the cat is all white, and often is odd eyed (one green and one blue eye). The cat itself is a work of art by mother nature. This mascot on the other hand is a horror movie character. With its crescent-shaped head (why the obsession with crescent?) and sinister looking eyes, this mascot could very well be the worst one I have ever seen. Also, colour selection is astonishingly poor; making the mascot look so dated… Cold-war era dated. Finally, let’s look at the ads. The idea is to blend the world’s best basketball players with the most beautiful scenes of Turkey. While it is not an original idea, if executed well it could be a solid ad concept. The problem is; it is not well executed. I will skip the photoshop job, which is amateurish and concentrate on two elements: the mise en scene and the slogan. Almost all ads look weird. Nowitzki is looking towards horizon (actually towards Asia). Why? Why is he holding the ball on his shoulder? That is not a basketball posture. What are you trying to communicate here? Probably nothing. God knows what Gasol is doing. Joel Anthony? I don’t even want to go there. The point is, these are very poorly executed ads and we, basketball fans, deserve much better. The second awkward element of the campaign is the slogan: “Giant get-to-geth-er”. Vertical lay-out of the sentence makes it difficult on the eye. As a reader I try to make some meaning of the initials, thinking it is a acrostic poem. Again this is a bad design decision. Moreover, the translation is awkward. 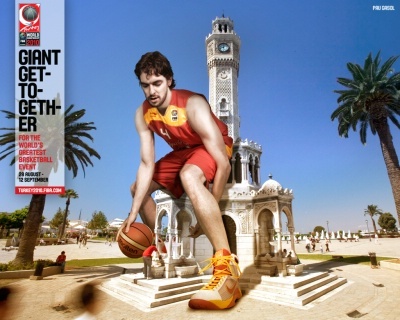 For those who don’t know “giant” (dev in Turkish) is a term Turks used to promote their national basketball players. 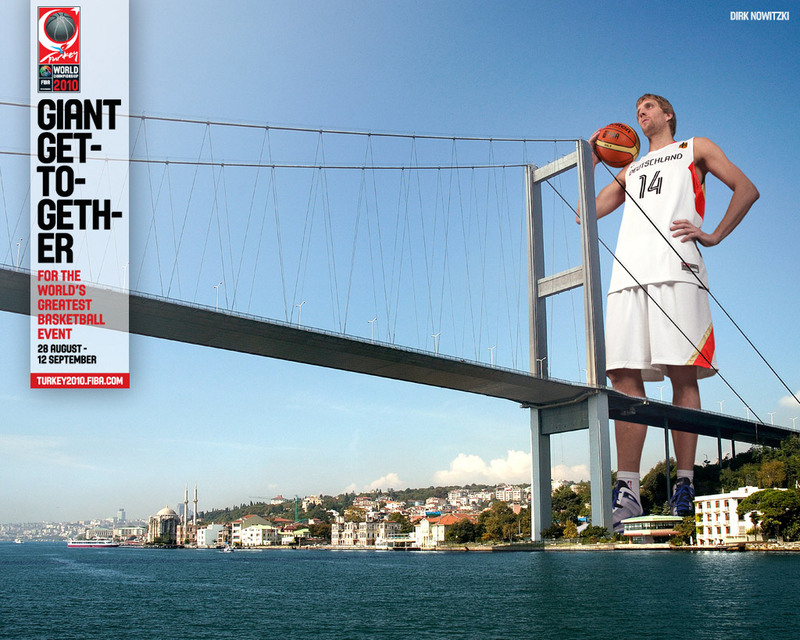 (here is the legendary 12 Giant Men ad) However, in English it just doesn’t work the way it does in Turkish. Instead , I would stick to “Big gathering”. It is shorter, simpler and more meaningful. Visually this is an amateurishly executed campaign so far. I don’t know if the organizers designed these materials in-house. From pure brand strategy point of view, I cannot give kudos to anything here. Let’s hope that they will put much more effort into the games than the promotions. Previous Post When to hire a celebrity for endorsement? Re Mascot, I believe you are unnecessarily critical and somewhat ignorant. Mascots are traditionally animal representations and for Turkey as the host it makes sense to use the Van cat as it is unique to Turkey (regardless of any games not actually being held in Van – which is understandable given the climate/environment). It also makes sense to select an animal that is agile and extremely intelligent. As for the colours, these have to represent Turkey and there are only two colours that the Turks would want to be represented by – that is Red and White which represents the country flag. The use of the crescent not only represents the flag but also the religious nature of the country which is 99% muslim. As for the look of the cat – unless you have failed to watch childrens TV in the last 10 years, you will notice there are far more terrifying looking cartoon and puppet characters out there than this mascot which children still love and treasure. I’m sure children can handle a cresent shaped head with one blue and one green eye. You must clearly have a phobia of cats as this to the normal eye looks nothing more than that, just a cat…. You say it is dated, but that is your poor opinion. It is actually vibrant and cool. Final point about the Tulip – it doesn’t make the logo look cluttered/busy – infact you don’t even initially notice the tulip in the basketball, it is cleverly and neatly placed. All in all this mascot is a true representation of Turkey – it is one of the best I’ve seen and having worked in the sports industry for many years, I have seen alot. So let the Turks have their glory on this – they have managed to pull off a great championship event which by any standard is turning out to be one of the best Basketball Championships ever. Their team aren’t doing so bad either. Thank you for your feedback Nini. I appreciate the time you to took to express your opinion. Professionally, I must respectfully disagree with your comments regarding the mascot and the logo. But I am more than happy to hear more from you. Your opinions are much appreciated. –	the cat (meoww!!!) I don’t have a problem with its’ head and eyes (yes there are more horrible cartoons out there) even if Fifa mascots are usually smiling or happy or fresh. MEN/DUDE see Zakunmi. This cat is straight out of an alley ( may be the creator[s] want to link alley oop with it or want to communicate toughness) fight. It is cheap too as the AND1 company logo was copied then substitutions were made. –	No problem with the crescent Head or around the ball if Turkey was trying to scare the world away by telling use it is an Islamic state and no love for other religions. Point- keep away from religion when it comes to sports visitors . –	The posters. only ‘Gasol’ made sence. I have never seen Gasol crossover, so I sure will hell want[ed] to see him crossover USA etc. What team Spain did at Beijing especially that dunk on Howard was..let me not finish it, I might want to win Howards financing a charity event in the future. It will be like the NBA all star games part2. Cool!!. The other posters should have used guerilla dunks making them more active. –	Yes the Giant together was too long, bla bla bla. Giant get together to what?That’s a distraction. ‘ … shold have ended it. ‘The creators don’t understand basketball. –	The poster—In turkey ‘GIANT’ is used to promote its players right? Well that will (did) not work for the international fan. Again (international) fans are moved by the smaller/shorter players not the bigger/stronger ones. They should used have their native players. And why if they were to use foreign nationals were some of the United States players not used (at least in your article)? Thank you very much Ohio, for taking the time to read and comment on this article. You brought some very good points such as the verbal strategy (get2gada). The way I see it, the designers’ intentions were good, but the execution was not. From what I read, the rest of the organizations was successful. As per your last point, they also used Kobe Bryant. But I am not sure if there was another US player. Ok.. can i see the other photos? u know bball is part game part show. In fact its more of a show then a game- even in the game itself. thing is since there is a cat (what was/is it’s name?) like that in Turkey, & it was decided that it’s unique type of eyes would be used for promotion, then it shld hav being decided to ensure it blends in well eg. make the eyes look like specs (Oakley/Gucci/any other designer glasses)- am sure a deal wld hav come out of that- or make the face softer. Zakumi looks REALI HEALTY (anoda move in gettin kids to seek better health). I realised dat the ‘ads’ wer mor to promote places in Turkey then basketball but wer lacking bite. and the cat as a logo may hav also or equally being from the Lebron James photo shoot with Slam magazine (106). I went checking in pastFIBA mascots and logos and I was amazed. No mascots until Japan 2006 (BAdtz am coming for u) no logo until (http://en.wikipedia.org/wiki/1990_FIBA_World_Championship—http://en.wikipedia.org/wiki/File:FIBA_1994_Logo.png) unless am mistaken. no poster either. In todays crazy market strategy movement (thank you yanks for wat u guys are doin over the divide) maybe using wack macots was the idea. Since I was not at any of the events I cannot comment. but I think we shld NOW do better. I want a situation where bball at national team level (can FIBA get it rit here) can compete with soccer. The NBA has done gotten it there to a large extent. Even to the Olympic level where bball (as far as am concerned. I stand for correction) is considered the number one sport NOW. But the NBA can only do as much, FIBA nids to do more for its own event. So lets look forward to to London 2012 (bball if u dont mind) and Spain 2014 FIBA world cup- if Nigeria can steal the name dream team for it\s under 23 soccer team so can FIBA (the name chamiponship sounds so…). Nothing on ground for the 2014 event so in hope a better discussion can now start and get the organisers and FIBA on board. Thanks for your continued interest and comments. You highlighted a couple of great points, the difference between NBA and FIBA being the main one. Basketball is rarely seen as a profitable line of business in Europe, and I don’t see it changing any time soon. I agree with you on the rendering of the cat. It could have been done much hipper. As per you other question, I think it might be practically impossible to measure the percentage of visitors come to an event because of the mascot. But let me know if you find anything about that topic! The NBA mascots may be like one of the real things in real life characters (eg Houston Rockets Cluth ’ or /Detroit Shocks (WNBA) Zap below) but the the above look like elemenmtary/1st stage drawings, which pass well for baby/kiddi (TV) cartoons if not comic like books of way back retro-back. They look like the real bad (MJ sorry). Some look mischievous esp go of the Phoenix Suns. Even mascots used by FIFA from 1966 to 1986- am tempted to add USA94 – ((http://webexpedition18.com/articles/fifa-world-cup-design-posters-logos-and-mascots-1930-2010/) (Nini is right there. It is all about artist expression & customer satisfaction. Who am I to decide where/how/when in what manner the audience/consumer should have his lunch but then again the marketing purpose for each mascot/cartoon may be different. 2001 FIBA World Championship for YOUNG MEN SAITAMA JAPAN mascot design (looks more like a logo). Getting that info: revenue made from mascots world/ percentage of people who come to an event because of a mascot may be a ‘co’ (as you call it via the Starbucks bristo beer discussion) should be considered in the future. I do have a deep love for mascots (I will bet my last jump shot there are people [fans/manufacturers/franchises owners/inner life mascot artists like Marc Taylor out there who would love to read a book on mascot or use it for capital sake. I would love to get my hands on such) so am willing in my spare time to dig around. The mascot hall of fame (to which I suspect FIFA & Olympic mascots are not a part of) may be a start. Now permit my asking, since Spain (which hosted last in 1986 without a logo/mascot) is hosting now what direction do you think they should take for effective using of mascots/logo/ad posters to steal some shine/fans over FIFA Brazil 2014? In general how use sporting events use mascots better to bring more visitors to the event? I will go for the NBA mascot over seas visitation eg like the Dallas Mavericks mascots CHAMP & MAVS MAN who travel world wide to show case their high flying entertainment (http://www.thedailycontributor.com/10-best-nba-mascots.html). It is part of the NBAs global (touch points) marketing. I would love (and am sure kids and some adults) to see Go of the Phoenix Suns bring his act here. Enjoy that read. Then you said basketball- ‘Basketball is rarely seen as a profitable line of business in Europe, and I don’t see it changing any time soon’. If basketball will not be a big business in Europe for a long time why are they bothering & housing the FIBA HQ? Give it to the people that are growing the sport. The non business approach of FIBA/FIBA Turkey 2010 senior men’s basketball organizers may have even affected the (graphic) effort (a part of the overall marketing) for the visual identity of Turkey 2010 FIBA CHAMPIONSHIP. I strongly think that mentality should change and really it’s in the hands of FIBA. If it wants basketball to grow in Europe it will, if it does not it will not. If the NBA (an American association can sell basketball to the French, & starbucks the same I believe with coffee then it is possible for FIBA to sell it to Europe). A look at Nike (and even the NBA) position as the king of ambush marketing (sport business mag quote)/rules interpreter says it is all about creativity and risks. In rules interpreter I will again use the 1984/5 NBA-NIKE-MICHEAL JORDAN SHOE SAGA as the example. Again FIBA should hire the best hands not minding if they come from FIFA or the NBA or IMG etc. 2. I ask- why does FIBA call its events(world) championship instead of cup?. The use of that phrase ‘world cup’ will see people (especially from soccer) logging on thinking it’s a soccer event. Like the NBA some soccer can be added by FIBA for die hard soccer fans. If Nigeria’s U-23 Olympic male teams are christened after the US senior basketball (bball) team, why cannot the same for FIBA using the tag name world cup. Like (giant) getogether, championship is too long. I will add Phil Knight; Nike’s CEO to IMG &co above cause they do things outside the book. Every marketing/Brand management book/program/course outside sports I read has a little ‘case study’ using Nike. Check out an old read- David Court’s if Nike can do it, why can’t we? (www.mckinseyquarterly.com). FIBA should start seeing itself as a marketing COMPANY with responsibilities to the basketball ‘bball’ community before say the NBA starts its own FIBA- g(lobal)NBA™. Sarunas Marciulionis (founder of the Northern European Basketball League [NEBL]) in sports illustrated (Feb.27, 2006.p85) did say that the NBA should come clean up the mess that is European (or was it FIBA) basketball. “Right now they are in the dark…they [fiba-europe, uleb’s (or according to an earlier Sports illustrated mag nov.27, 2000.p98 THE FIBA) euroleague, fiba’s supro-league, have no vision… there needs to be a long-term master plan…I think David could unite Europe” he said [italics mine]. Even the attempted settling among themselves sited in Fiba Assist (Aug/Sep 2001 bi monthly news letter) did not seem to work . I see gNBA™ happening cause if there is any thing the NBA will be afraid of now or in the future it is not going to be the present head people at FIFA but a combination of a small sports property called MLS when it decides to go global (with NBA type entertainment business sense. I saw the American junior team when they came over here) & a the many ex-American international soccer players who will venture into FIFA bringing in that entertainment dollar sense (then FIFA will know it screwed up big time with the PUMA CAMEROON AFRICAN NATIONS CUP JERSY(S) ENTERTAINMENT/NIKE- MJ- NBA TYPE MARKETING STRATEGY) I mean see NIKE freestyle soccer. That is the part future of sports. 3. Thanks for the photo link. I liked some of the new (the old I liked was Gasol) photos( Kobe on the brigde/tony on/in the lake/kobe in/on the lake); mamba in particular (on the bridge) ‘is’ so good I showed it to a sculptor friend of mine to use it instead of his earlier idea for his project ( he decline due to time/money constraint) but I personally will use it and its adjusted version for my own presentation. On kobe on/in the lake I would have preferred him emerging from the lake violently (no pon intended) for a dunk or some thing causing a tsunami reflected by the lake/boats. Longoria’s pose is o.k- I mean he has to think about how to dribble past or tear drop over the village opponent. To think I can play bball in this village by the ‘pool’ (bball by a pool???) is…. Hmmm/ha/hmmm nothing like bball in the sun by a lake in a town with village girls… NOTHING! Hey notice the palm tree at the lower corners of the photo. May be that is where the rim is/are. Bball rim support made of a palm trees. That most be a cool town to be in. The other photos like I said (except Gasol) have nothing to offer. For the traffic tower which Kobe stood by & Nowitzki by the bridge ‘looking towards Asia’ as you said, I remember the photo of Vince Cater 2kSydney over Weis and Ferdinand2.8kBeijing over Howard. That’s what the brigde and tower should be used for; bball rim support with Kobe/Nowi dunk over someone or use those photos syd/Bei (or any other) for these illustrations. Am always for continuity as in for a growing brand like FIBA it should ensure that it can link new events (even if its not its own but is a big participant) after it (helps) finishes the last one. That’s Olympics to Fiba event; Fiba to Olympics. If the NBA needs the Olympics (I believe more than it needs FIBA) then FIBA better borrow a que. I am not familiar with that term. What is a gNBA? Its a name I coined that stands for global NBA. I looked at FIBA (and FIFA) and said these organisations may not be marketing their sports as well as they should. The future will tell soon with FIFA (as American sports men and women join the ranks as administrators there). FIBA is a little obstacle to the NBAs globalization initiative. the only option is for FIBA to improve its marketing & creativity. As you said, NBA is well ahead of FIBA in terms of marketing. That said, FIBA oversees a bigger spectrum of games (National teams, male-female, under 18 etc…) I believe FIBA has much to learn from NBA, especially in terms of mktg and creativity! Now, my reason for coming. Turkey tourism and the 2010 basketball Champioship; where can I get information. Am working on an article- tourism and sport; the economic and GDP event angle. Can you help?